It’s summertime, which means Americans are embarking on vacation trips to destinations near and far. One getaway in the “far” category would be a trip to space, something a host of private companies are trying to make possible. 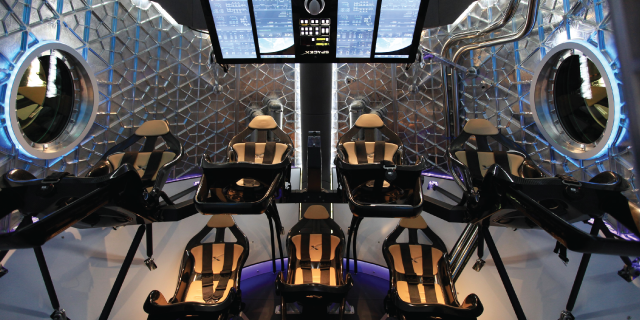 But it’s not an excursion that appeals to everyone – more U.S. adults say they would not want to orbit the Earth than say they would, according to a new Pew Research Center survey. Once regarded as a topic best suited for science fiction, space tourism is currently under development by private companies such as SpaceX, Blue Origin and Virgin Galactic. Interest in being a space tourist is higher among younger generations and men. A majority (63%) of Millennials (born 1981 to 1996) say they would definitely or probably be interested in space tourism. Only minorities of Gen Xers (born 1965 to 1980) (39%) and those in the Baby Boomer or older generations (27%) would be interested. About half of men (51%) say they would be interested in orbiting the Earth in a spacecraft, compared with one-third of women (33%). 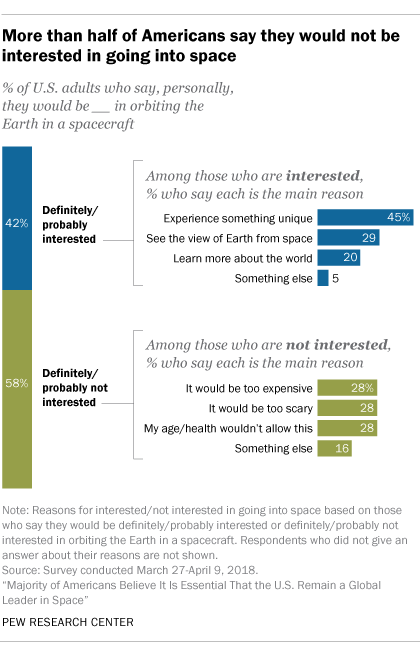 Among the 42% of Americans who said they would be interested in traveling into space, the most common reason given (by 45% of those asked) was to “experience something unique.” Smaller shares of this group said they would want to be able to view the Earth from space (29%) or “learn more about the world” (20%). Among the 58% who said they would not want to orbit the Earth aboard a spacecraft, equal shares said the main reason was that such a trip would be either “too expensive” (28% of those asked) or “too scary” (28%) or that their age or health wouldn’t allow it (28%). Men and women and older and younger Americans cited different reasons for why they would not want to travel into space. Millennials and Gen Xers were more likely to say the main reason they would not be interested was that it would be too expensive or too scary. But for Baby Boomers and older generations, the most common reason they would not be interested in orbiting the Earth was that their age or health would not allow it (of those who were asked this question, 45% of those in the Baby Boomer or older generations said this, compared with 6% of Millennials). Men were more likely than women to say the main reason they would not be interested in orbiting the Earth in a spacecraft was that it would be too expensive (37% vs. 22%), but women were more inclined than men to say they would not want to go because it would be too scary (34% vs. 18%). 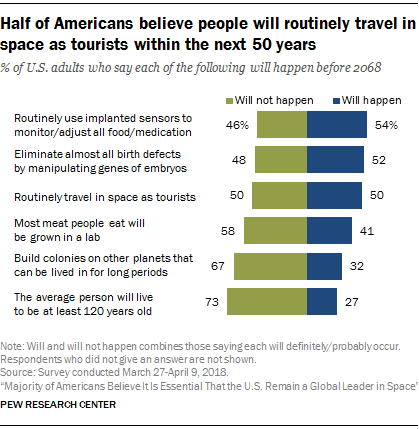 Americans were also asked about their expectations for space tourism in the next 50 years. The public is split over whether this will happen, with half saying that people will routinely travel in space as tourists by 2068 and half saying this will not happen. Americans are more skeptical about the possibility of colonies on other planets – an endeavor championed by space entrepreneurs Elon Musk and Jeff Bezos. About one-third of Americans (32%) say people will build colonies on other planets that can be lived in for long periods by 2068.